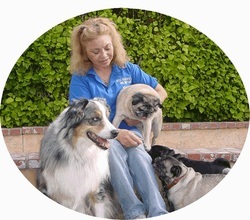 Rose Healey has been conducting dog obedience classes with Dog Services Unlimited for over 20 years, and has always had a love and enthusiasm for dogs. She works with several rescue organizations, helping homeless dogs find new families. Rose enjoys helping her students transform their unruly pups into well-mannered, cooperative canine family members. She teaches about a dozen group obedience classes each week, as well as doing In-home lessons. Besides working with dogs, Rose's other interests include gardening and tole-painting, and spending time with her faithful four-legged companions, which include a Red Australian Shepherd, a feisty Chihuahua, and an even feistier cat! See our "Wags N' Brags" page for many testimonials from her students over the years.